The second book in our series examines Fahrenheit 451, by Ray Bradbury. A work of science fiction, this novel was first published in 1953. It explores a dystopian America where books are illegal and firefighters start fires instead of putting them out, in order to destroy the books and kill those who would attempt to think for themselves. Fahrenheit 451 is considered one of the seminal works in the genre of science fiction. Ray Bradbury creates a mood of tension in the reader, by establishing an authoritarian tone very early on in the novel. The story follows Guy Montag, a firefighter who has grown disillusioned with the world he’s in, and the transformation he undergoes in an attempt to better understand this world and by extension himself. The book begins with what I feel is the greatest opening line in any novel ever written: It was a pleasure to burn. The goal of any writer is to engage the reader with words that ensnare, and Bradbury begins with the gold standard in my opinion. It was this line that made me pick this book up and never let go. 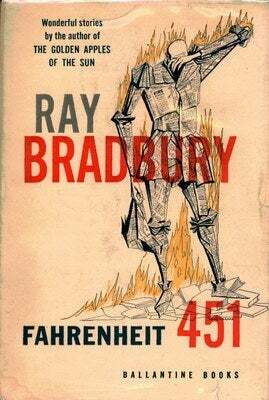 Bradbury wrote Fahrenheit 451 as a reaction to what he felt the government was devolving into. This was written at the height of McCarthyism and after the horrors of the Hiroshima and Nagasaki bombings. It also reflected his disbelief that in Communist countries, individual thought and inherent civil liberties were being crushed by governments in the form of overlords. The beauty of this novel is that thematically it is still incredibly relevant. Sadly, it’s our government that is watching us and determining what is patriotic and what is anti-American. Fahrenheit 451 is beautiful in its prophetic poignancy. I first read this book when I was a junior in high school. I was simply wasting time in the school library, trying to avoid any academic endeavors when I came across the novel. I was always told that the measure of a good book is when you can open up to any page and the words affect you in a memorable way. Well, I only opened the first page, and the aforementioned opening sentence hooked me. Please go out and purchase this book in its book form, not as an e-book. If you already have the book, go ahead and reread it. You’ll be glad you did. As always, comments and conversations are encouraged down below.